Jemison served six years as an astronaut for NASA and is the first African American woman to be admitted into NASA, as well as the first African American woman to go into outer space, which she accomplished while aboard the Space Shuttle Endeavor in 1992. Provided Tech’s rich history, interest in scientific innovation and diversity of students, this event was sold out and had a lengthy wait list to show for its popularity. The lecture was preceded by a VIP reception, where those invited had the opportunity to have hors d’oeuvres and mingle with Jemison herself. The reception welcomed some faculty, fans of her achievements, members of student media and even a large group of her spirited sorority sisters from Tech’s Alpha Kappa Alpha chapter. The gathering was concluded by a photo opportunity with Jemison before her lecture and a chance for those in attendance to introduce themselves. Perhaps the most memorable photograph of the night was with a young, African-American child, who stood beside Jemison while holding a copy of her 90’s NASA headshot. As seating was limited, a large line formed outside of the Ferst Center for the Arts well before the doors opened at 6:30 p.m. People from a wide range of ages, genders and races were in attendance to see the former astronaut speak — many of whom were young enough to remember reading about her life and achievements in their grade school textbooks. 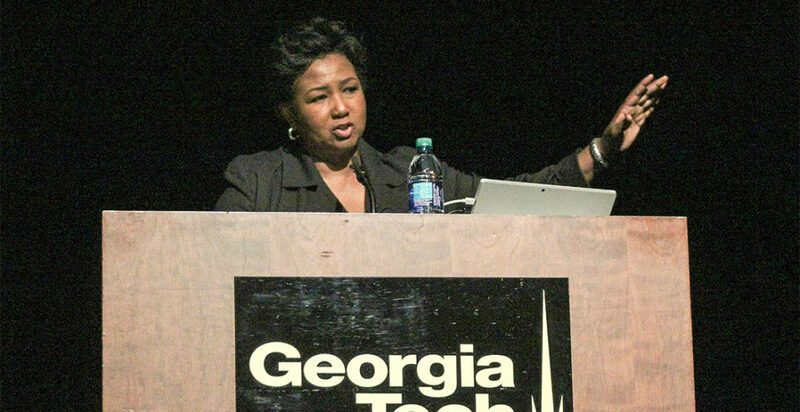 Another important takeaway from Dr. Jemison’s speech was the insistence of belonging as she stated, “You belong just as much as anyone.” This message can speak to anyone regardless of race, gender or religious preference and especially someone feeling lost within a large institution such as Tech. Regarding her period spent as an astronaut, her lecture provided attendees with an interactive portion. This was where Jemison asked questions about whether or not the audience would want to be vegetarian or meat-eaters in space or what fabrics would be the most effective in space. The interactive nature of her speech gave her a more personable touch and was captivating for even the youngest of attendees. As a professor, Jemison is also an advocate for women in STEM and touched on the importance of diversity in gender as well. She went to school for chemical engineering in a time period where women did not have the same tools and opportunities as we do today and ended up changing the world. Jemison is a prime example of how much women and minorities can contribute to society when given the opportunity, and she shares a message of hope for a more inclusive future. In all, Jemison’s lecture was well rounded and inspiring to all in attendance.